Each of Bali’s southern districts varies noticeably from the next. Kuta, Legian and Seminyak, just minutes from Ngurah Rai Airport, offer sun, sea and waves, surfing lessons, hotels and lodges from budget to 5 star. Souvenir shops and restaurants abound and the night life thumps along into the early hours. The streets are lined with colourful stores selling everything from surf boards to souvenirs. Take the kids to the Waterbom Park, a truly fantastic day out at an aquatic park for the whole family! Bali Slingshot is one of most scary extreme sports located in Kuta Centre. Not recommended for people with heart problems or fear of heights, nor is the Hackett Bungy Jump. If you do not like the busy resorts and night noise, move up to Seminyak, renowned for its sophisticated boutique shopping, luxurious private villas and swish hotels, or even further up the coast to Canggu with its own country club. South Bali, situated south of the airport, includes Nusa Dua on the Bukit Peninsula, one of best tourist enclaves in the world, featuring breathtaking white beaches. It covers 350 ha, has 11 hotels with 5 stars, many with 4 stars, luxury villas, its own golf course (Bali Golf and Country Club) and much more: shopping centres, conference halls, a private hospital, and a wide range of restaurants from local warungs to fine dining. The tropical gardens are incredibly beautiful, with water features and ponds of colourful Japanese Koi fish. Most hotels offer a multiplicity of water sports, Balinese cooking classes or days out exploring the interior of Bali. 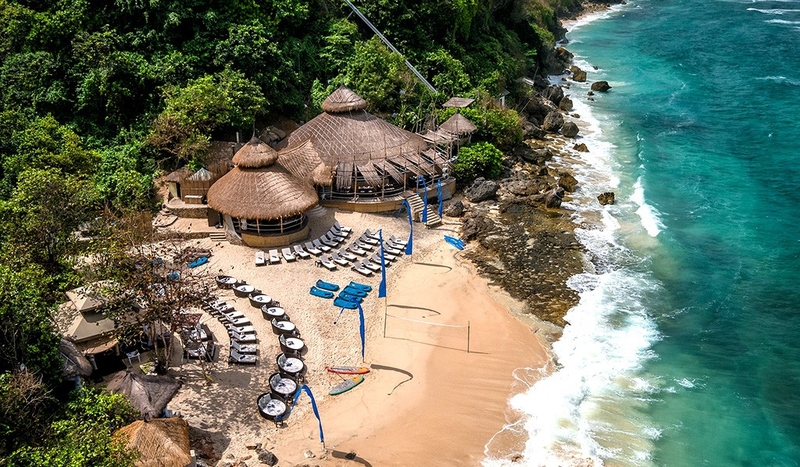 Geger Beach is five minutes from Nusa Dua. Tourists call it "a hidden paradise" because of its clear water and sheltered location. It is a favourite family spot for swimming as well as surfing. Just north of Nusa Dua is a narrow spit or peninsula called Tanjung Benoa, with a beautiful, long white sandy beach. Here visitors can enjoy many types of water sports, including snorkelling, para-sailing, diving, sailing, glass-bottom boat views of the marine life and even trips with a local fishing crew who will welcome you aboard.Tanjung Benoa boasts more than 20 hotels. Places of interest include a Chinese Buddhist Temple, a Hindu Temple and a Mosque. Take a boat trip around to Turtle Island, where several species of turtle are reared or nursed back to health. You should also take a day trip from Benoa Harbour, on the Bali Ha’i or one of the many boats which transport surfers, divers and other tourists to the three nearby islands of Nusa Penida, Nusa Lembongan and Nusa Ceningan - just 20 km offshore across the Selat Badung. Here you can enjoy world-class surfing on a budget. There are surf spots for experts and hundreds of varieties of fish and coral for those who enjoy diving. Stay for just the day or spend the night in a thatched hut or a 5 star hotel – your choice. Jungutbatu village offers travellers inexpensive lodgings. Only 7,000 people live on Lembongan Island, and there are no cars in sight. On the north side of the bay is Serangan Island, with its own fishing fleet, and a dolphin enclave where you can swim with these beautiful creatures. There are moorings for ocean-going yachts, and the Bali International Yacht Club has its base here. The International Yacht Festival is frequently held in Benoa Harbour. Participants sail from Benoa Bali and finish at Tanjung Perak Harbour in Jakarta. The island also has a turtle hatchery. You are guaranteed to enjoy the Bali Sunset Cruise, a three-hour dinner cruise around the Benoa Harbour with entertainment by traditional Batak singers on the main deck. On the south-western tip of Bali’s Bukit Peninsula, Uluwatu is at the top of many a surfer's destination list. The path down to the beach is well hidden, off the road to the temple called Pura Uluwatu: an amazing three-court structure on top of a cliff. Beware of badly behaved monkeys - they're expert thieves. If you arrive in the afternoon, stay to watch the stunning sunset from the cliff top overlooking the Indian Ocean. If you are looking for a beach that offers peace and solitude, head for Jimbaran Beach, with its pure white sand, amazing views and spectacular sunrises and sunsets. If you have a taste for seafood, Jimbaran’s restaurants, located directly on the beach, are the best places to dine. Enjoy barbequed seafood while listening to the waves breaking gently on the sand – this is a must! Ask for Jimbaran "secret sauce" with your food. Your fresh fish will come from the adjoining fishing village of Kedonganan, which has a traditional fish market and a many colourful "Jukung" Balinese fishing boats at anchor or hauled up on the beach - colourful subjects for photographers. Other beaches nearby include Nyang Nyang, Labuan, Sait, Padangpadang, Bingin and Suluban. Ayana Resort and Spa sits high and secluded above the Indian Ocean and overlooking Jimbaran Bay. It is off the beaten track, and away from the action further up the coast. The hotel is becoming a popular wedding and honeymoon venue. Along the east coast, north of Benoa is the resort of Sanur, Bali’s very first tourist town, featuring upmarket beachside hotels. Smaller waves and calm waters make it ideal for families with young children. Sanur is famous for its first expat, the Belgian artist Adrien le Mayeur, whose home is now a cultural museum - well worth a visit. Sanur Beach is located only 4 km from Denpasar. At full moon, many people come for relaxation, swimming by moonlight in the tranquil waters. Several other popular beaches in the Sanur area are Mertasari Beach, Grand Bali Beach, Padang Galak Beach, Semawang Beach - but there are many more waiting to be explored. The town has several annual festivals, including the Sanur Village Festival towards the end of September, and the Kite Festival on 15 July; September is also Kite Season. Sanur is a good starting point for various attractions inland, in the nearby Gianyar and Ubud areas. Ask about the animal parks for exciting trips for the kids, especially Taro Elephant Park, where the whole family can ride these gentle beasts or help wash them. Several dive shops are situated in the village, so many diving trips leave from the beach near the Inna Grand Bali Beach Hotel - and so do ferries to Nusa Lembongan,. South Bali encompasses parts of the Regencies of Badung, Gianyar, Klungkung and the three islands of Nusa Penida, Lembongan and Ceningan.